Wood Memorial Day, the centerpiece of the Aqueduct Racetrack spring meet, will get even richer with a two-day, $165,375 Pick 6 carryover into Saturday's card. Favorites failed to find the winners' circle in Friday's Pick 6 sequence, with longshot winners taking Race 4 (Touch of Bling, No. 4, $61), Race 6 (Mahvelous Marie, No. 6, $48), and Race 7 (Purrageous Dyna, No. 4, $40.80). Rounding out the sequence was Pretentious (No. 8, $7) in Race 5, Holiday Disguise (No. 7, $10.20) in the Grade 3 Distaff as Race 8, and Gold Cross (No. 10, $15.40) in Race 9. The consolation payout for five of six winners was $17,400. Including all five stakes on the card, Saturday's Pick 6 will begin with the Grade 2, $300,000 Gazelle in Race 6 (with a post time of 3:38 p.m.) and highlighted by the $400,000 Carter Handicap, New York racing's first Grade 1 of the year, and the Grade 2, $1 million Wood Memorial, the final Kentucky Derby prep of the spring meet. Post time for the Wood Memorial is 5:55 p.m. Fans can catch all the Aqueduct stakes action on Aqueduct Live from 3-5:30 p.m. (ET) on MSG+, and on a live national broadcast from 5:30-7:30 p.m. (ET), NBC Sports Network (NBCSN), which will include coverage of the Wood Memorial, Grade 2 Blue Grass at Keeneland and the Grade 1 Santa Anita Derby at Santa Anita Park. 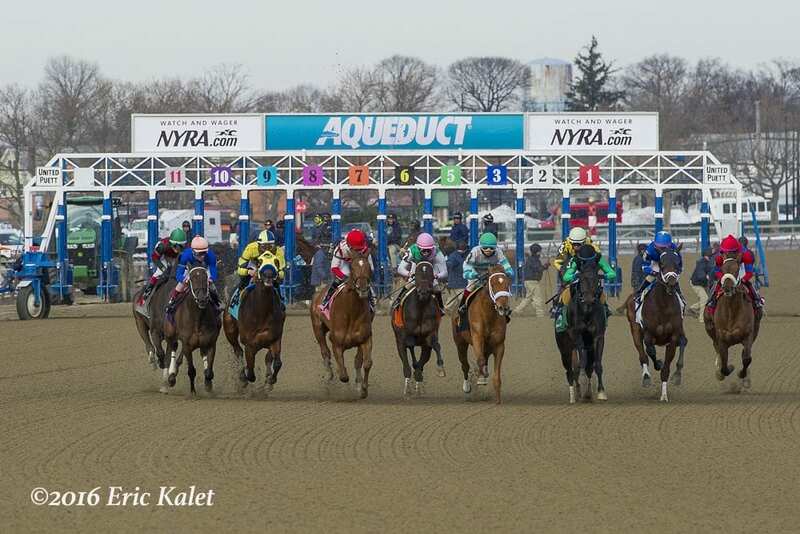 This entry was posted in Horseplayers and tagged aqueduct, aqueduct live, carryover, carter, Gazelle, nbcsn, pick 6, pick 6 carryover, road to the kentucky derby, wood, wood memorial by NYRA Press Office. Bookmark the permalink.